02/09/05 : Please note that I have been away from this site since a very long time and recently just got back after so many e-mails from pleople either thanking me or asking me how to get in contact with people mentioned on this page. Over the many years I have lost contact with all and unless they write me I have no idea how to get to them. So all you out there who helped me with this page I would love to hear from you ! 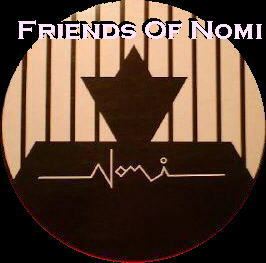 Welcome to Nomi's Tribute page. This site is dedicated to a artist unknown to many.But for all Nomi fans world wide this site is just a place to come together,remember,enjoy and be a part of a man who touched us in his own way. On this home page, I'll include some information about Nomi's background,discuss how I originally became a fan and what I liked best about this master performer. Thanks for taking a look at my site. Be sure to get in contact.Nomi fans everywhere come together and take a bow. Klaus Sperber was born in 1944 in the Bavarian Alps.He grew up in Berlin where he developed a passion for opera.Working as a child extra at the German Opera house and attending the Berlin Music school as a teenager.Later on he worked as an usher at the Berlin Opera. Klaus moved to NY City in 1972 where he soon became a Gordon Blue pastery chef.He often posed as a mannequin in a window at Fiorucci,a NYC's high fashion store. WHAT MAKES NOMI STAND OUT FROM ALL THE OTHERS? 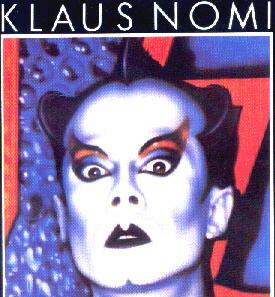 Klaus Nomi dared to be different as he combined opera with pop,rock,cabaret and mixed it all with a futuristic sound of synthesizers.Take all this together with his almost inhuman voice,raging from operatic soprano to Prussian general and what you get is NOMI! Then being the year 1982.I got introduced to Nomi's music through a friend . The "Simple Man" album got me hooked on Nomi. Remembering walking down a street, reading my favorite music magazine. One article catching my attention...Nomi had died of a unknown disease of which I had never heard,didn't even know how to read that weird looking word.....AIDS? 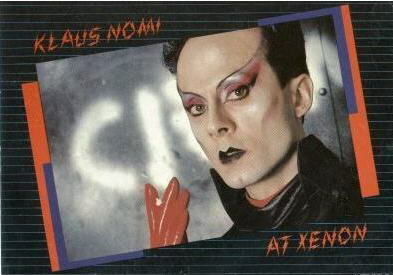 After all these years well what can I say....look at this page and see what Klaus Nomi means to me.At times wondering where he would have been as an artist and what he would have become if he still had been among us today. But all what remains are memories,his music and his voise! Hopefuly this page will make others want to check out Nomi's music. As for those who know and love Nomi like I do. He is among us forever.